Kids and road trips: an amazing combination of excitement, energy and, if the drive is long, boredom. Playing I Spy or 20 Questions, or looking for license plates from all the states and provinces, is fun for a little while, but those classic road games won’t last forever. What if your kids could watch their favorite movies without bothering you? Your local mobile electronics retailer offers many rear seat entertainment options to entertain backseat passengers. This article looks at the most common solutions and how they work. 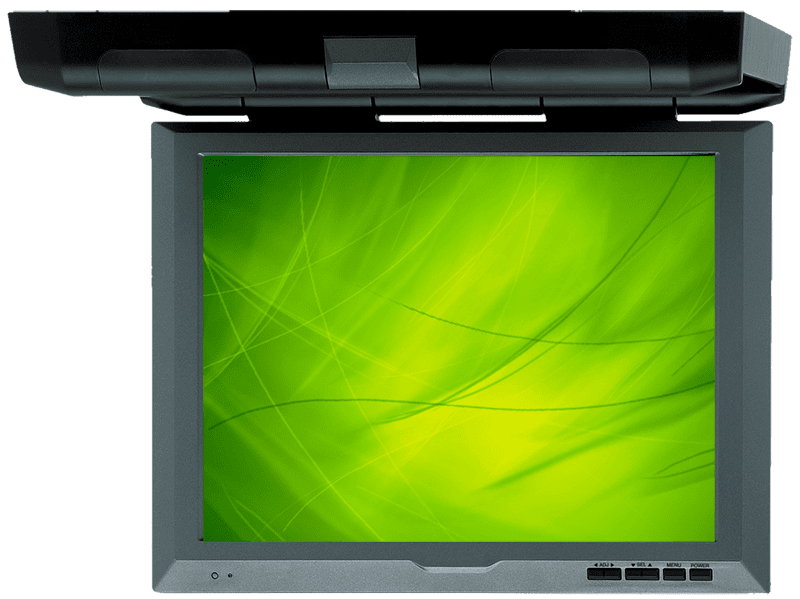 The overhead monitor is a thin LCD screen that mounts to the ceiling of your car or truck. The screen has a hinge on the top edge so it can be folded up against the roof when not in use. Monitor sizes range from 7 inches up to around 15 inches, with 10-inch models being among the most popular. Most systems include a built-in DVD player. Watching a movie is as simple as inserting the disc and letting it start. 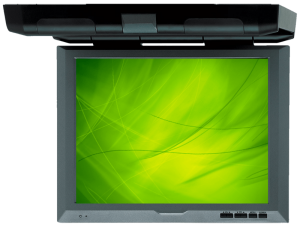 Some systems include USB ports or SD card slots to play MPEG or AVI digital media files. Many units have multiple auxiliary A/V inputs for connections to aftermarket source units or external video sources like a video game system. Your kids listen to the audio for the movie using a set of wireless headphones. Most of these headphone systems use infrared transmitters, so the kids have to be in the vehicle for them to work; not a problem on the average road trip. Some overhead monitors also include an FM modulator system. An FM modulator will take the audio signal from the movie and broadcast it over an FM radio station frequency. If everyone in the vehicle wants to listen, all you have to do is tune the factory radio to that station. The installation of an overhead monitor usually requires that your installer cut a hole in the headliner. If you have leased the vehicle, plan on leaving the screen in at the end of the lease. The installer will attach a mounting bracket securely to the roof support structure; then the monitor can be installed. Many overhead monitors include built-in dome lights. The factory dome light location is often a great spot to mount a screen, so integrated lighting replaces the factory unit. Headrest monitor solutions are the same as the screens in an airplane. For the rear-seat passengers, the screens are on the back of the driver and passenger headrests. There are two options for headrest screens: a display installed in most factory headrests, or a replacement headrest unit. Installing a screen in a factory headrest will require that the upholstery on the rear be cut out to mount the screen. Again, this is a permanent solution. Aftermarket headrest systems vary in quality from manufacturer to manufacturer. Since the headrest is a critical and fundamental component of the safety system of your vehicle, this is not a place to skimp out on quality. Audio playback typically works the same way as an overhead monitor. One advantage of many headrest systems is the availability of two audio channels. If you have two kids and two completely separate playback solutions, each child can watch a different movie. Headrest systems never block the perspective of the rearview mirror. 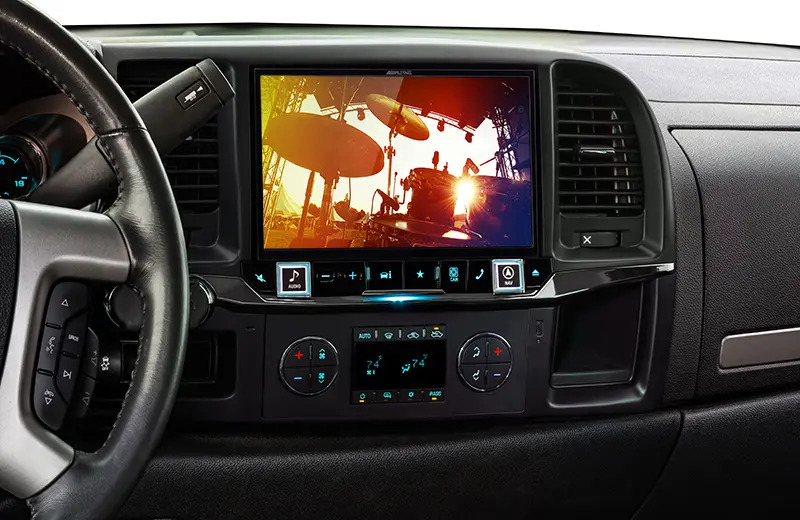 If you have an aftermarket multimedia receiver installed in your dash, then you can probably use that to play movies for rear-seat passengers. 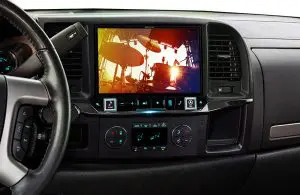 Your passengers will still need monitors in the rear, since it’s illegal in most states and provinces to have a video entertainment system playing within view of the driver. 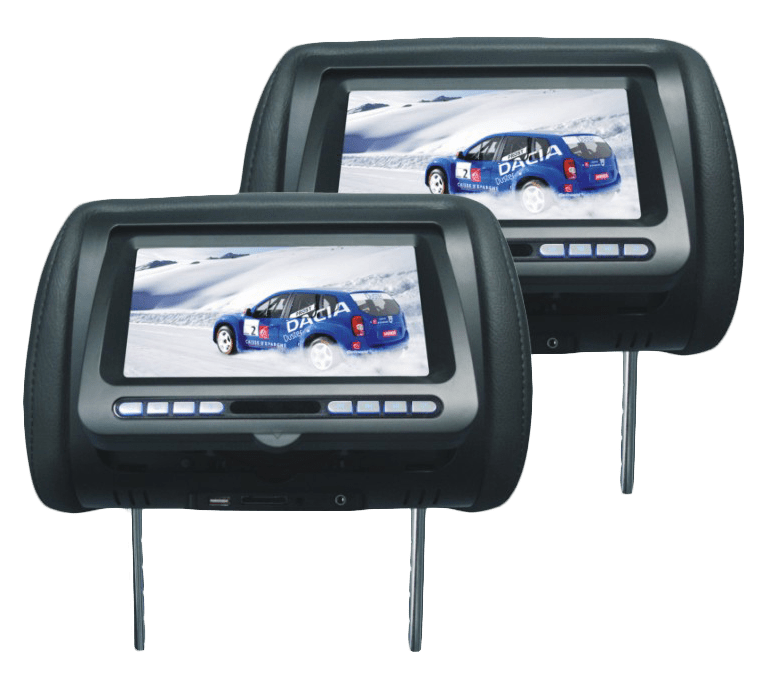 Source units with dual- or two-zone capabilities will typically let you play a DVD and send the audio and video to screens in the rear while the driver and passenger can listen to the radio through the factory speaker system. 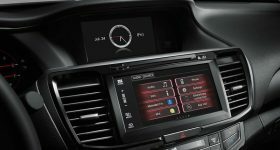 If this is a feature you want to use, check with your mobile electronics retailer; different brands and models of head units have limitations on what sources can work with what zones. 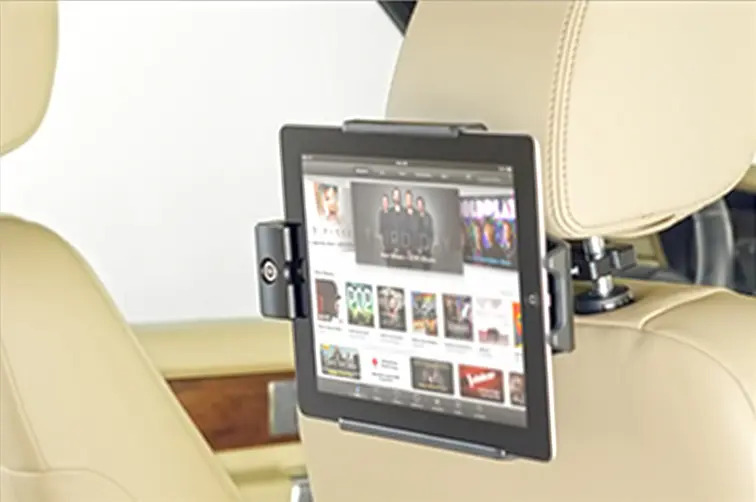 If you own an iPad or another tablet, many brackets are available to let you secure those to the headrest mounting posts. Your mobile electronics retailer can install a high-current USB port in the back seat to keep the tablets charged for long trips. 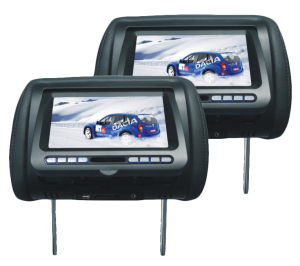 A few companies make monitor systems that attach to the rear of a center console or strap to the seat in front of you. While these solutions don’t integrated with the vehicle as cleanly, they do offer entertainment – and that’s what matters. If there is no dedicated rear-seat entertainment solution for your vehicle, don’t despair. Many mobile electronics retailers can create something for you from scratch. A custom tablet mount for the seat or center console isn’t a problem for most of them. If you’re planning a road trip, drop into your local mobile electronics retailer a few weeks before you leave. They can show you the rear-seat entertainment options for your vehicle and book an appointment to have your choice of system installed.